Theresa May’s Brexit vote failed spectacularly, however, she did survive her confidence vote. 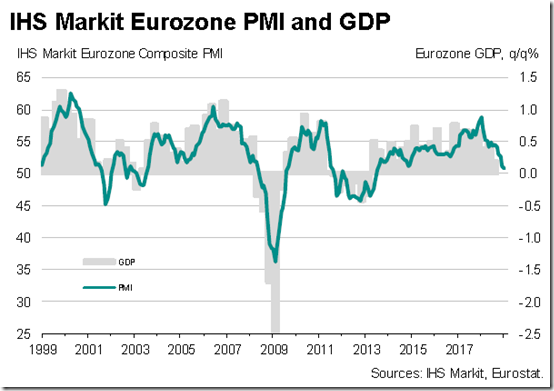 Lots of unanswered questions regarding their path forward and the Bank of England seems worried about the effects on the overall economy. Home sales sank 6.4% in December to their weakest level since 2015, ending a difficult year at a new low and offering fresh evidence that the housing market could be in for a bumpy ride in 2019. Wilbur Ross was quoted as saying the US and China are “miles and miles” away from resolving the trade war. The government shutdown was temporarily ended for 3 weeks. In recent days though, we are seeing signs that Trump is ready and willing to go to the mattresses on getting a border wall funded. California utility company PG&E files for bankruptcy as potential damages for the wildfire damage grows. Unemployment in the US added 312,000 new jobs as a strong labor market continues. The unemployment rate did increase to 3.9% as labor participation rises. Trump ally Roger Stone was charged in the Mueller probe. More details likely to come out in the coming weeks/months. When the Fed met in January, they held rates steady but their tone changed a lot. It seemed in Q4 that Fed didn’t care about the markets falling, wasn’t worried by it or didn’t feel it was their job to infuse the markets with dovish talk. 6 weeks later and while not a lot has changed, rhetoric certainly has. Yes, things look slightly worse in some instances, but not so much so to cause a phase shift in my opinion. Chairman Powell is new to the post and think he realized that by not sounding friendlier and more supportive (ie. 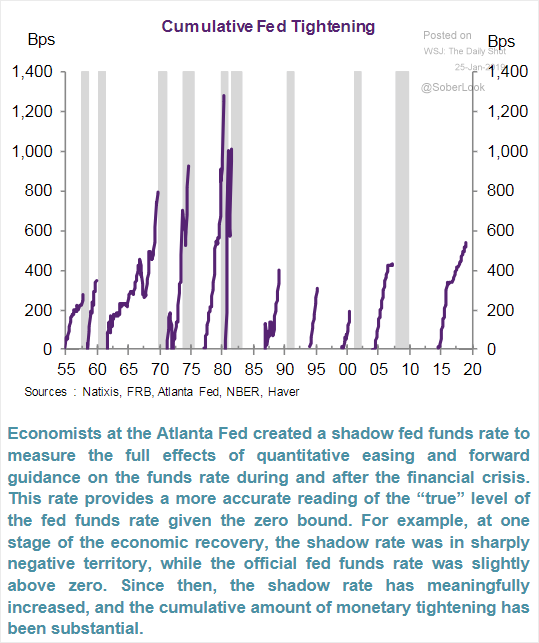 The Powell Put), the markets could create a self fulfilling prophecy. The Fed The Federal Reserve’s monetary tightening cycle may already be over. 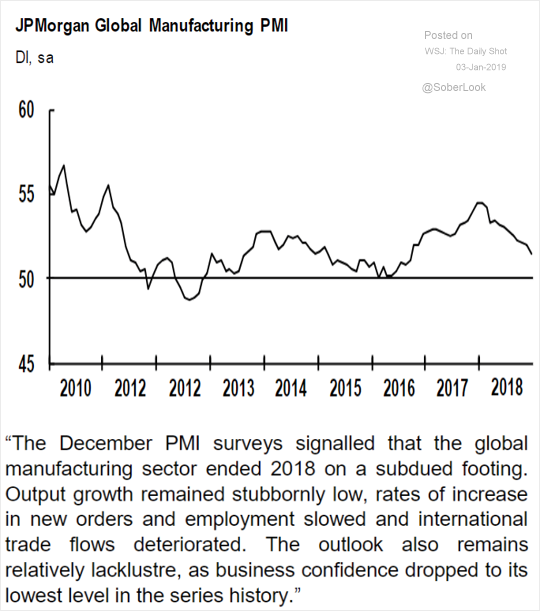 Growth is slowing globally and while the US has been resilient, the data is continuing to weaken combined with a lot of political uncertainty due to the shutdown. Besides raising rates, the Fed was also selling $50B of securities per month to wind down their balance. The combination of these 2 activities result in more tightening than usual, all while I believe we’re late stage in the business cycle. Very recently, the Fed telegraphed that it’s no longer committed to reducing balance sheet each month and are going to be flexible with the sales, which is what they should have done. The markets like it when the Fed has their backs and because of a shift in statements by the Fed, we’ve seen the markets buoyed during the month. 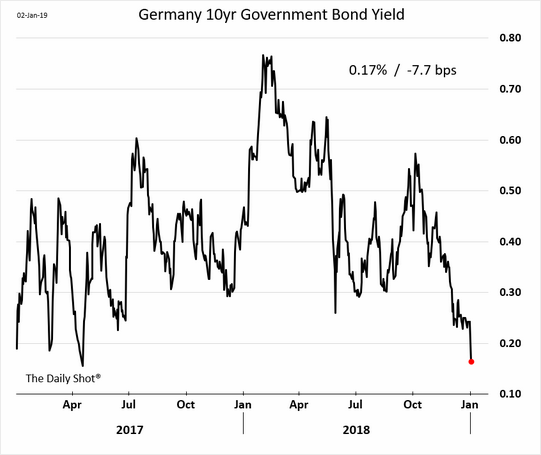 “The biggest risk is the corporate bond market. U.S. junk-bond issuance has been prolific, and the quality has been poor. Many issues have been floated with no covenants [legal agreements regarding issuer behavior]. The investment-grade corporate-bond market has also grown massive; it is much larger than it was going into the prior credit crisis. A Morgan Stanley research report suggests that, based on leverage ratios alone, 45% of investment-grade corporate bonds would be rated junk right now. 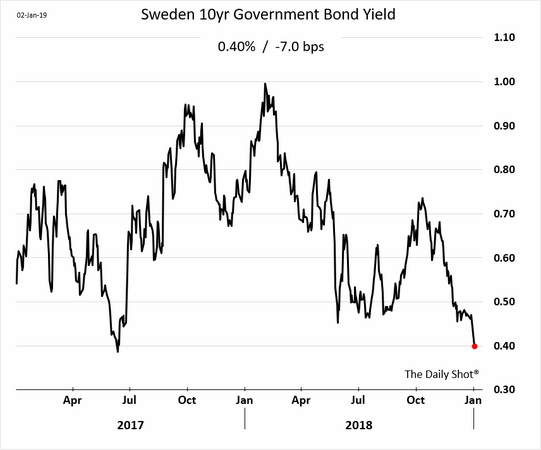 The report further suggests that around 60% of corporate bonds currently rated BBB would be rated junk by the same leverage-ratio metric. That’s around $1 trillion of par value, or about 150% of the junk-bond market’s value. There are problems with debt broadly. I keep hearing the president say that this is the strongest economy ever, which isn’t true. There was a bump up in second- and third-quarter gross domestic product, but the growth is debt-based. We have floated incremental debt when we should be doing the opposite if the economy is so strong. In fiscal 2018, we increased the national debt by $1.27 trillion. The deficit officially was nearly $800 billion. The difference is phony IOUs from the Social Security system and expenditures on purportedly one-off military operations and natural-disaster relief. U.S. GDP is $20.66 trillion, so a $1.3 trillion increase in the national debt is 6% of GDP. 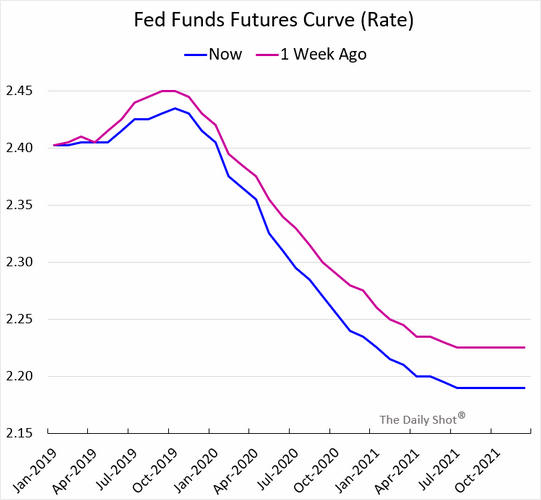 The Fed Funds futures curve shows the expected Fed Funds rate over a period of time. 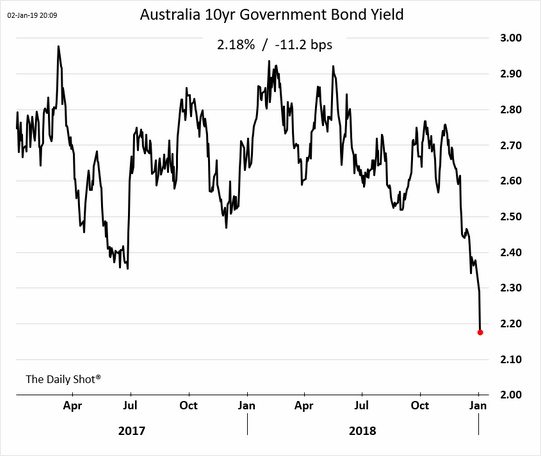 This is saying the expectation is for rates to start falling in 2020 via rate cuts. Those usually coincide with falling growth and recessions. 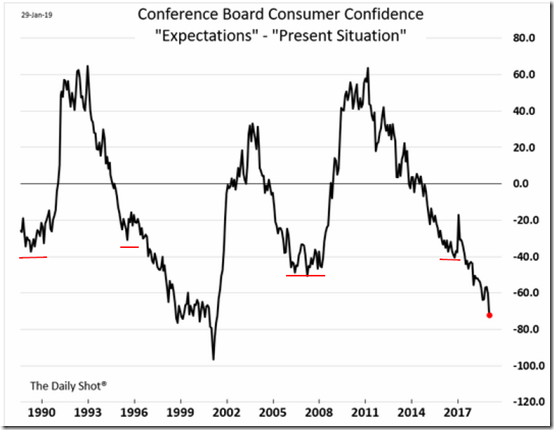 Consumer confidence today vs. in the future is saying two very different things. 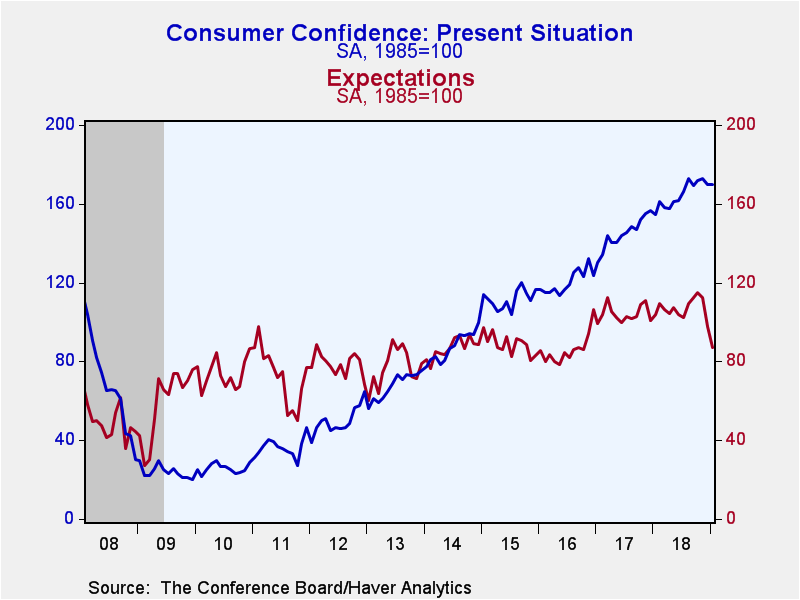 When you take the difference of the previous chart, you can see what happens when expectations for today and the future diverge and by how much. Both manufacturing and services saw growth slow closer to stagnation. The factory sector reported the weakest expansion since the current production upturn began in July 2013, while the service sector expansion was the smallest since August 2013. Inflows of new work fell compared to December, registering the first such decline since November 2014 and signaling the largest drop in demand for goods and services since June 2013. The current debate over the fantastic start to 2019 in the S&P is whether it’s a bounce in a bear market or a continuation of buying the dip like we’ve seen since 2009.
in the Dow Jones Industrial Average on December 26. At this point, though, stocks have steadily recovered, reclaiming most of their losses. 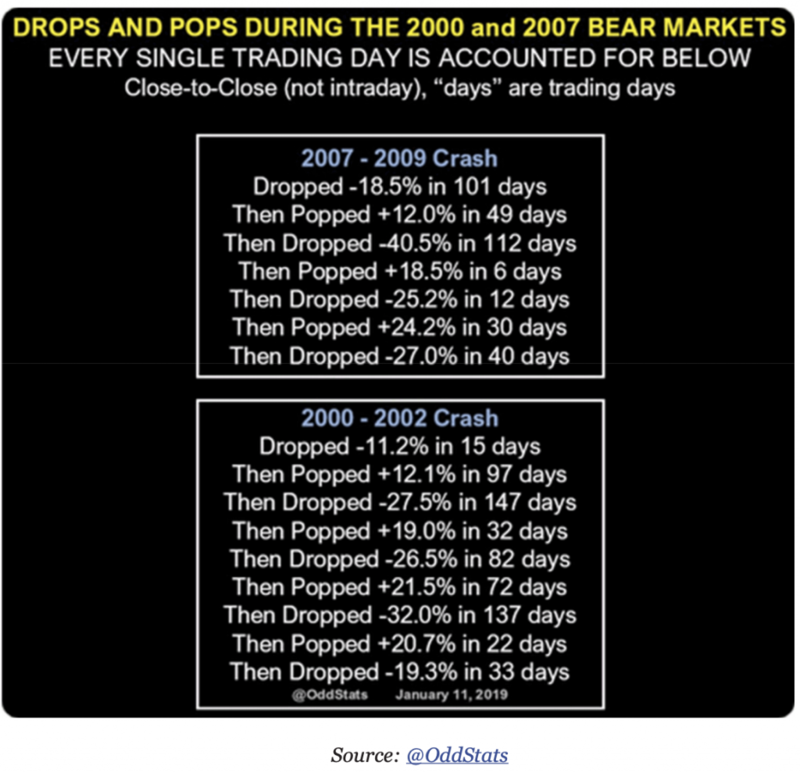 But what most people don’t know is that big percentage moves like these happen exclusively in bear markets. 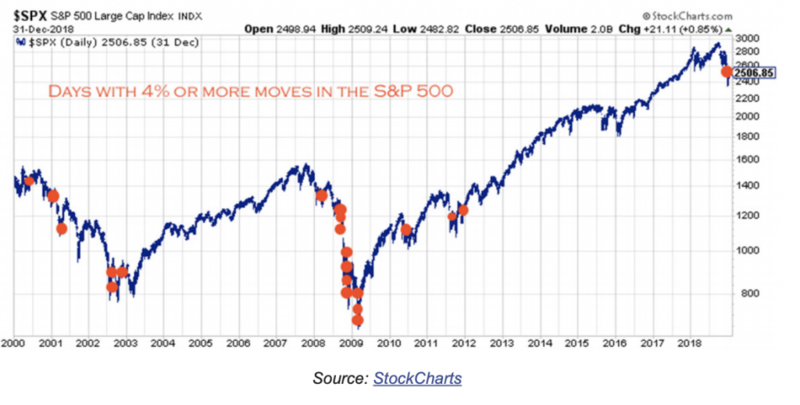 As you can see, percentage moves of 4% or more only happened when stocks were already in a bear market. 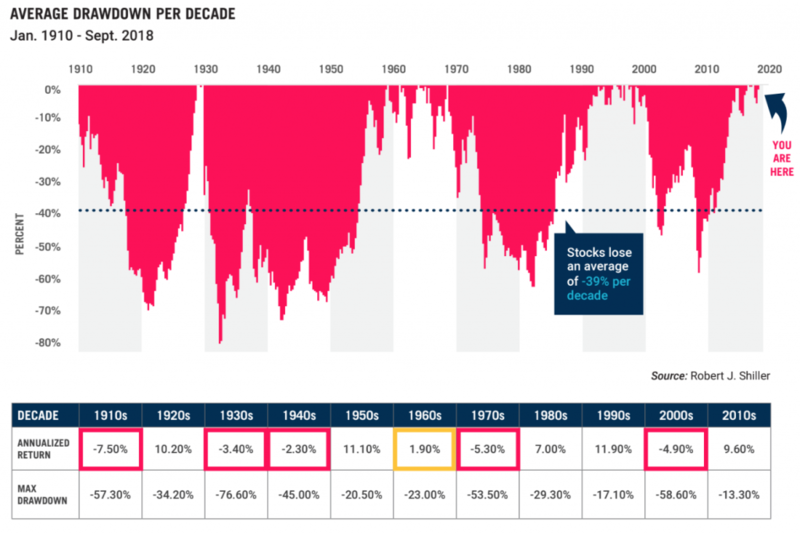 So far, this decade (2010-2020) has seen the shallowest peak to trough decline (max drawdown) going back to 1910. Besides this decade and the 90’s, the smallest decline was just over 20% up to almost 77% in the 1930’s. 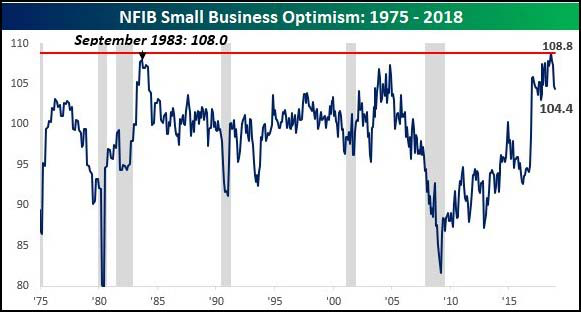 It appears small business optimism may have peaked for now. When you get into the stock market matters the most for the next 10 years. 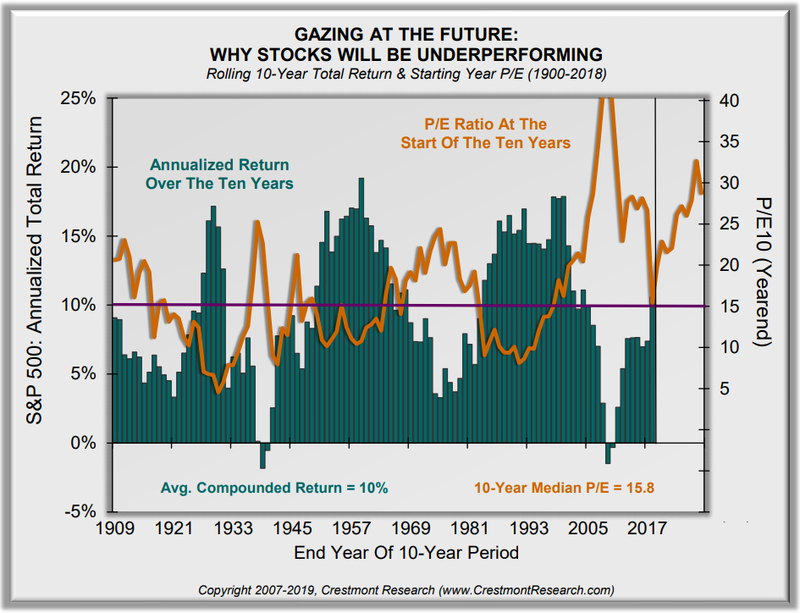 High starting PE ratios have an extremely high correlation with lower than average future 10 year returns. 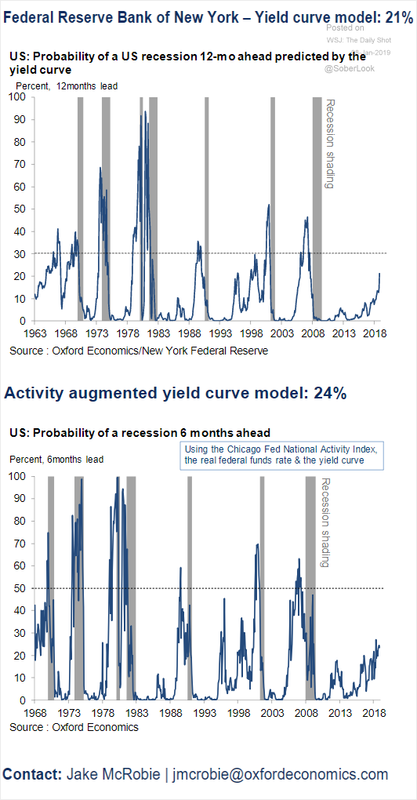 Not a huge surprise that recession expectations for 6 and 12 months out have been rising. 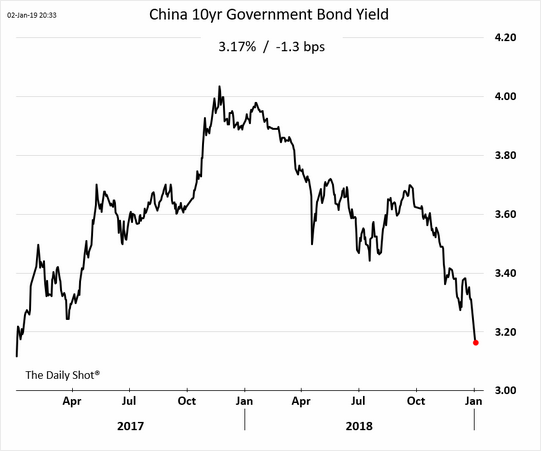 Here are a series of charts on 10 year government bonds from around the world. 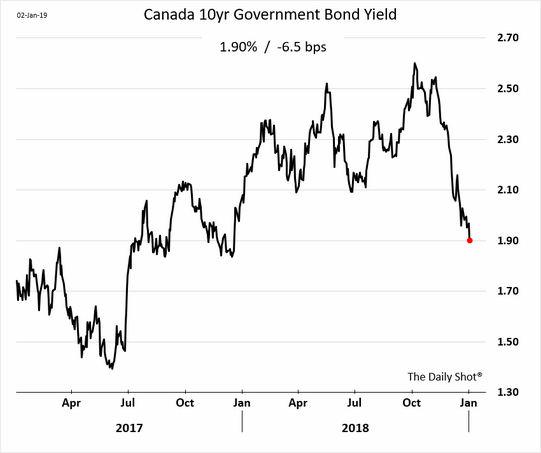 As you can see, rates have been falling in response to slowing global growth and inflation.